If you are a health care worker, you are really blessed. Of course, helping others can be very difficult at times, but the chance to be with other humans, to get a sense of the raw interior that we all have and that we all wish to protect at times, is very rare. We can only touch that rawness in honor if our goal is to offer benefit in whatever way we can. In the Buddhist tradition, we say that sentient beings are as numberless as all the points in space. And we say that all of them have been our mother in some life time. In fact, if you realize how we all have space inside, just as Menla does, and that we all connect with each other in that space, you might get the sense, as I do, that all sentient beings are still our mother. Their very rawness is directly connected to our open heart, and it is only by opening our heart to them, that we get a sense of not who we are but how we need to be in the world. I believe that practicing Menla, even a little on a regular basis, can be extremely helpful for most health practitioners. I have found it to be so. I do this practice before I go to my medical work each day and whenever I feel I am in a difficult situation. I even do it at airports. On a personal basis, I often do it when I am receiving a health treatment of any sort, not just for me but also for my health care provider. If you have a story of your personal connection to Menla that you would like to share, please send it on. I will try to post these as often as is practical. 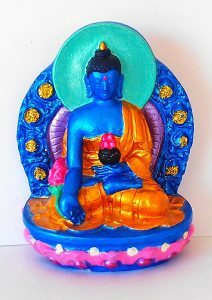 Sign up for Medicine Buddha Today programs. sometimes get what you need or want, and sometimes realize that just asking with open mind and heart is itself good enough, and sometimes realize confidence in the basic goodness within yourself and all your experience, just as they are right now. However it comes, you will get help. 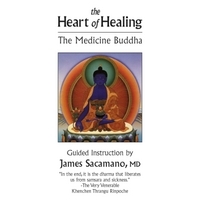 Audio CD: An in depth introduction to the life-changing and healing practice of Medicine Buddha along with guided meditations in body scan, sitting, and Medicine Buddha. Click image for more details. enjoy good health, happy lives, wisdom, and appreciate the causes of such harmony. May they be free of dis-ease and the causes there of. May they enjoy a happiness free of disharmony. And may they live in equanimity with good will for all.